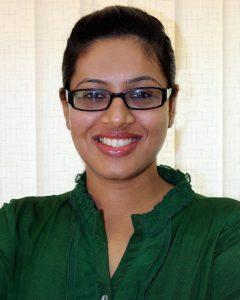 Dr. Swetha Ray graduated from Ragas Dental College & Hospital under the world renowned Tamil Nadu Dr. M.G.R. Medical University, Chennai, in the year 2007. She has interned and learnt with extremely talented doctors and had her own private practice in the heart of Chennai for 5 years. She has been an observant student of dentistry and a passionate doctor with special inclination for endodontics and cosmetic dentistry. She keeps herself constantly updated by attending national and international seminars and courses. Dr. Swetha has presented clinical papers in national conferences and has won multiple awards too. Dr. Swetha Ray believes in a comprehensive treatment plan with an interdisciplinary approach keeping the patients’ needs in mind. Dr. Swetha Ray is an avid book lover, foodie and enjoys playing badminton. Her interests are travelling, fitness and trying out different cuisines. She is an expert with professional as well as friendly approach towards the problem and a caring individual who takes care of hygiene and comfort of the patient. Till now I am very much satisfied by her treatment of my dental problems. Nice.Good doctor.Treatment procedures explained with details.Highly recommended. My father visited for tooth ache . She explains the reason for the tooth ache. She suggested for either teeth extortion or Root Canal..We preferred Root Canal treatment.